In ion-exchange chromatography (IEC) the stationary phase is a cross-linked polymer resin, usually divinylbenzene cross-linked polystyrene, with covalently attached ionic functional groups. 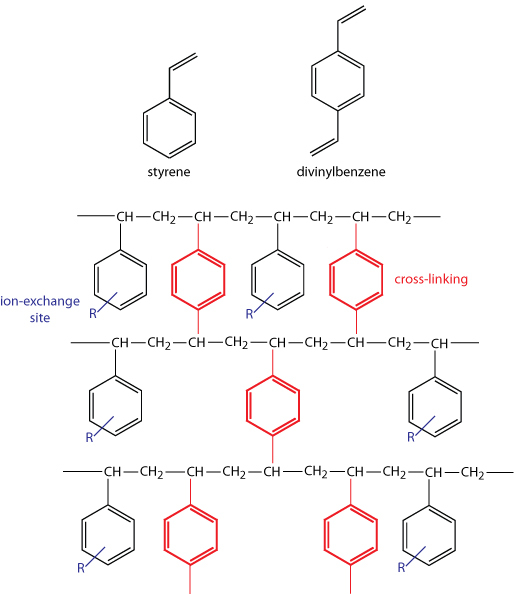 As shown in Figure 1 for a styrene–divinylbenzene co-polymer modified for use as an ion-exchange resin, the ion-exchange sites—indicated here by R and shown in blue—are mostly in the para position and are not necessarily bound to all styrene units. The cross-linking is shown in red. The counterions to these fixed charges are mobile and can be displaced by ions that compete more favorably for the exchange sites. Figure 1: (left) styrene–divinylbenzene co-polymer modified for use as an ion-exchange resin. 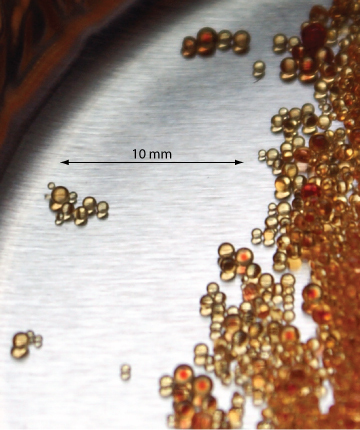 (right) The photo here shows an example of ion-exchange polymer beads. These beads are approximately 0.30–0.85 mm in diameter. 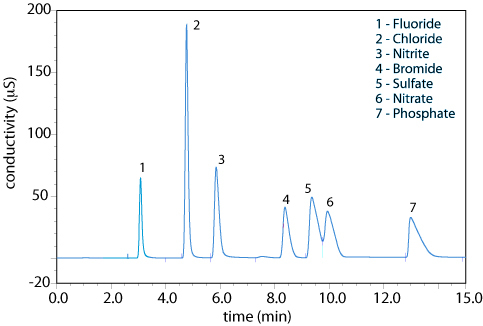 Resins for use in ion-exchange chromatography are smaller, typically 5–11 mm in diameter. Imagine if we had a tube whose surfaces were coated with an immobilized cation. These would have electrostatic attraction for anions. If a solution containing a mixture of positively and negatively charged groups flows through this tube, the anions would preferentially bind, and the cations in the solution would flow through (Figure 2). Figure 2: Separating action of amino acids in an anion exchange column. Strength of binding can be affected by pH, and salt concentration of the buffer. The ionic species "stuck" to the column can be removed (i.e. "eluted") and collected by changing one of these conditions. For example, we could lower the pH of the buffer and protonate anions. This would eliminate their electrostatic attraction to the immobilized cation surface. Or, we could increase the salt concentration of the buffer, the anions in the salt would "compete off" bound anions on the cation surface. Ion-exchange chromatography is an important technique for the analysis of anions and cations in environmental samples. For example, an IEC analysis for the anions F–, Cl–, Br–, NO2–, NO3–, PO43–, and SO42– takes approximately 15 minutes. A complete analysis of the same set of anions by a combination of potentiometry and spectrophotometry requires 1–2 days.